"Overall, A Hell of a Woman, featuring largely pink-collar workers, housewives, and students—is raw, given its language and level of violence. Most memorable are Rebecca Pawel's "The Kiss of Death," in which women collectively deal with the "fat jerk" at their tango dances, Eddie Muller's "The Grand Inquisitor," with its twist on the Zodiac Killer, and Charlie Huston's "Interrogation B," a laconic account of a female cop at work." "A superior collection… Megan Abbott has assembled a talented list of contributor who deliver inspired performances." Dark tales of lonely housewives, diner waitresses yearning for more, schoolgirls with dangerous ambitions, hustlers looking for one last score, factory girls with big plans, secretaries with hidden talents, schoolteachers with secrets to burn … and every one of them A Hell of a Woman. This anthology, edited by Megan Abbott, features original stories by Lynne Barrett, Charlotte Carter, Christa Faust, Alison Gaylin, Sara Gran, Libby Fischer Hellman, Vicki Hendricks, Naomi Hirahara, Annette Meyers, Donna Moore, Vin Packer, Rebecca Pawel, Cornelia Read, Lisa Respers France, SJ Rozan, Sandra Scoppettone, Zoë Sharp, Sarah Wienman, and several boys granted honorary admission to the Girl’s Club: Ken Bruen, Stona Fitch, Allan Guthrie, Charlie Huston, Eddie Muller, and Daniel Woodrell. The collection also features fifty bonus pages of “appreciations” of female noir pioneers and characters by some of today’s top crime writers and critics, and a special foreward by prize-winning crime novelist Val McDermid. SAYS EDDIE "Megan Abbott flatters me by saying that I was the first guy asked to contribute a story to this collection. It’s nice to be a token male, I must say – especially surrounded by such a stellar group of writers, whatever gender they may be. I also have to thank Megan for keeping on me, way past deadline. I understand that mine was the last story submitted. Oh well, all’s well that ends well: within a month of turning in “The Grand Inquisitor,” plans were underway to turn it into a film, which has now happened. I have to add that it is extremely gratifying to have my story next to Daniel Woodrell’s – he is one of my favorite writers (read his books!) and his contribution to this collection, “Uncle,” is one of the most perfectly realized pieces of short fiction I’ve ever read." 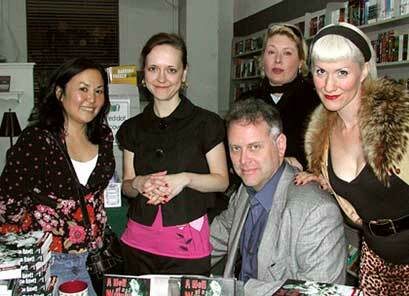 The A Hell of a Woman booksigning at Book 'Em in Pasadena featured anthology contributors (l-r) Naomi Hirahara, editrix Megan Abbott, Eddie Muller, Cornelia Read, and Christa Faust.